Gosset has given Champagne’s workhorse grape a prestige positioning with the launch of a £90 fizz that’s made entirely from Pinot Meunier – a first for a Grande Marque. Called Grand Blanc de Meunier, the Champagne was shown in London yesterday, where press and buyers were given the first taste of the new product, which is a non-vintage extra brut, with just 3 grams per litre of sugar added at disgorgement. Although the fizz is billed as a non-vintage, it is primarily made from Meunier selected from the 2007 harvest in Champagne, which was a relatively cool vintage in the region. Complementing this base was the addition of 10% reserve wine from the 2006 vintage – a warmer year producing riper grapes. With as many as 10 years ageing in bottle in Gosset’s cellars, the Champagne house is attempting to debunk a widespread belief that Meunier doesn’t produce long-lived fizz. 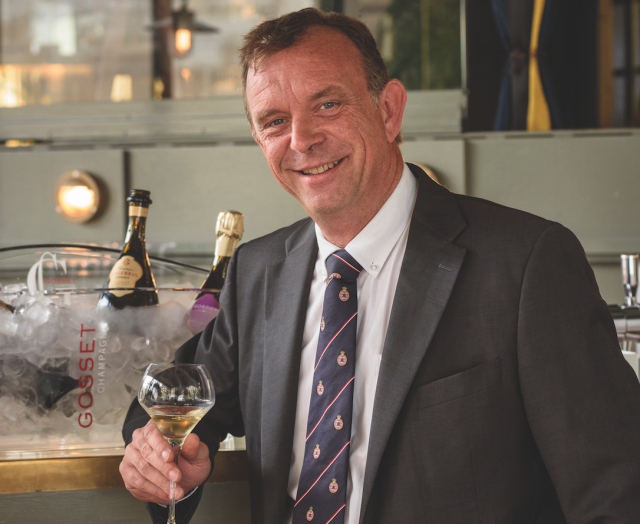 Indeed, admitting his own scepticism surrounding the variety’s suitability for fine age-worthy Champagne, Bertrand Verduzier, export director for Gosset, said in London yesterday that before trying the Grand Blanc de Meunier, he didn’t think Meunier could be used to create such a product. Key to the quality of the Meunier used in the Gosset fizz, and the performance of the grape more generally, is the location of the vineyards, according to Verduzier. With the majority of Meunier planted in the Marne Valley – where the grape accounts for over 60% of all productive vines – it is generally tied to lower-lying, damper sites that are less conducive to high quality red grapes compared to the celebrated slopes of the Montagne de Reims, home to grand cru villages such as Verzenay, Ambonnay and Bouzy. Meunier, which is a clonal variation of Pinot Noir, is favoured in the Marne Valley because the variety buds later than Pinot Noir – and ripens earlier – making it a more reliable performer in terms of yield in this frost-prone part of Champagne. However, Meunier produces its best results in the crus of Champagne, particular around Epernay, where it can be found mixed among Pinot Noir vines. Meunier is not favoured over Pinot Noir in sites where the former grape could reach its best expression, quite simply because a premier or grand cru vineyard in Champagne can only use these quality designations if it is planted with Pinot Noir (or Chardonnay). “If you do have Meunier in a premier or grand cru area then you cannot call it grand or premier cru – it needs to be Pinot Noir or Chardonnay,” he said. While grand cru vineyards are normally favoured over premier cru sites, the best places for Meunier tend in fact to be premier cru vineyards, according to Verduzier, because Meunier is now only found in the most frost-prone spots of grand cru areas. “You do find Meunier in grand cru areas in the Montagne de Reims, but it is always at the bottom of the slopes because it is colder there, and Meunier is more resistant to the cold,” said Verduzier. Although Meunier has been replaced in the mid-level slopes of the top crus of the area, he said that older vineyards still had a mix of Meunier and Pinot Noir, with growers unable to spot the difference. For the Grand Blanc de Meunier, Verduzier said that Gosset cellarmaster Odilon de Varine had selected Meunier from mid-slope, south and east-facing sites in premier cru vineyards around Epernay, mentioning the following villages: Cumières, Pierry, Moussy, Vinay, Chavot, Monthelon and Hautvillers. He said that the vines were generally aged between 25 and 30 years old. Vital to the quality of Gosset’s varietal Champagne is not only the source of the Meunier, but also the decision by the house to block the malo-lactic fermentation in its wines – an approach to winemaking in Champagne that is relatively rare, although famously practiced by the maison, as well as Alfred Gratien, Lanson, and Krug, with the latter favouring the inclusion of Meunier in its long-lived Grande Cuvée. “Meunier is an easy grape in many ways, it is always fruity, it is resistant to lower temperatures, and it is not as difficult to vinify as Pinot Noir, but to make this wine is not easy at all,” said Verduzier of the Grand Blanc de Meunier. “It is complicated because Meunier has a fruitiness, but not necessarily the structure for long ageing,” he added. To achieve the desired quality for extended maturation, Verduzier told db that Gosset had not only prevented the conversion of malic to lactic acid in the base wines, but also added Chardonnay lees to the Meunier base wine. These lees bring added “freshness” to the wines from the fruity Meunier, according to Verduzier. Such a technique was also used for Gosset’s Blanc de Noirs, made from 100% Pinot Noir, and launched last year, although Verduzier told db that the house had used a greater quantity of Chardonnay lees for the Meunier-based Champagne. Notably, the pure Pinot Noir Champagne was also created from the 2007 base vintage, but launched one year earlier than the Blanc de Meunier – providing further proof that Meunier has the capability to age for long periods if the grapes are sourced from good sites and the wines are handled in a manner to preserve acidity. Just 5,000 bottles of Gosset’s Grand Blanc de Meunier have been produced as a limited edition to complement the Grand Blanc de Noirs – of which there are 10,000 bottles available. While both varietal Champagnes are a “one-off”, Verduzier told db that Gosset hopes to reproduce them from this year’s harvest, which began last month, and promises to be both big and brilliant. However, with the current examples spending as much as 10 years ageing in bottle before release, should Gosset reproduce the Champagnes from this year, the market wouldn’t see the cuvées until 2028. While Gosset may be the first Grande Marque to release a pure Meunier Champagne, there are several other producers, particularly growers, who make a fizz with just this grape. As previously reported by db, Champagne Jean Moutardier has found success with a its Cuvée Pure Meunier – a brut nature fizz using only this grape – that was launched in 2004. As for growers who bottle 100% Meunier Champagnes, celebrated examples come from names such as Egly-Ouriet, Jérôme Prévost, and Laherte Frères. Meanwhile, as covered by db.com back in 2012, Armand de Brignac is planning to launch the world’s first prestige cuvée Champagne made entirely from Pinot Meunier grapes. The brand, famous for its bold packaging and association with American rapper Jay-Z, plans to isolate a wine from its single vineyard called Clos Yons, which is planted exclusively with Pinot Meunier. Finally, in the UK, Exton Park has launched a pure Meunier English sparkling, although this is made as a rosé. Meunier, which means miller in French, takes its name from the white flour-like dustings on its leaves. It makes up as much as one third of the vineyard area in Champagne, and most commonly features in non-vintage blends, bringing fruitiness to cuvées that are released ready to drink. To read more about the variety, click here for a feature article in which Michael Edwards explores the many faces of Meunier. 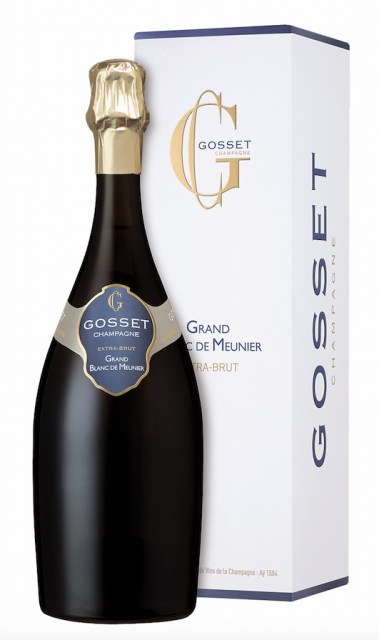 Is Gosset in fact the first grande marque to release a 100% Meunier champagne? What about Les Champs de Romont – a 100% Meunier champagne from vineyards in Sillery released by Moet a few years ago as part of their Grands Crus Trilogy set? Interestingly this was also a Grand Cru so it seems that it is not entirely true either than a Meunier champagne cannot be a Grand Cru. No no Jiles, there are many more. For example Leclerc Briant.